Making a presentation to foreign diplomats in Geneva on January 21, presidential secretary Lalith Weeratunge contradicted President Mahinda Rajapaksa on the number of troops deployed in the Northern Province. Weeratunge is in Geneva as part of the campaign to fight against the impending resolution at the Human Rights Council in March 2014. On Sunday, January 19, President Rajapaksa while opening a hospital constructed with private sector donations claimed that there were only 12,000 Army personnel in the entire Northern Province. Speaking at the opening of the Tellippalai Trail Cancer Hospital president Rajapaksa added that the strength of the Army in the North at the end of the conflict was 70,000. Yet making his presentation to Geneva diplomats just two days later Weeratunge says that there are 80,000 Army personnel in the North as of October 2013. Illustrating with a graph the Presidential Secretary claims that that there has been a reduction of 30 percent of Army troops from the peak deployment of roughly 120,000 in December 2009. Interestingly the graph shows that the number of troops in the North in fact increased after the end of the war in May 2009 to peak in December that same year. Weeratunge’s numbers do not consider the Navy and Air force personnel deployed in the Northern Province. Nothing wrong with troops staying in the North. Too many masquerading terrorists about still active plotting with the likes of Rita Sebasthian. Even British and American forces remained in Germany for 50-years after WW2, and American’s are still there; so thaat’s good enough precedence to follow in SLK. The Brits and Americans did not have control over the local populace in Germany like the SL Army has in the North and East. In West Germany, Germans had self determination and ran their own affairs. Another reason for American and British presence was the Cold War and containing the Soviet threat , because you will recall Germany was split into a West and East Germany. This hymie apologist’s attempts to hide the war crimes of the tribe throughout history (as Mel Gibson famously said, all world’s wars past and present were waged by them)will not be successful. He will be smoked out from his hiding place – B&B soon. Look at these idiots who defend US troops been deployed on other sovereign nations but oppose Sri Lankan Army been deployed strictly inside our legitimate borders. Saying “US troops deploted on other soveregin nations” is meaningless because the situation with each country where American troops are stationed is unique to that country. In Japan, the Japanese central government has authorised America to have a base there, which not only greatly benefits the local economy but also is a defense umbrella for Japan against China. In Afghanistan the Americans are there because Al Qaeda , who was protected by the Taleban , attacked the US on 9-11. What happend to GL peris. He told a big lie to Hilery Clinton two years ago. GL wont be able to visit USA. That is not the reason dud. The Rajapakses want a big army as safe deposits to be used against the Sinhala people who revolt against them. However, they cannot keep such large numbers in the South as people may become suspicious. If the army takes hold of swathes of land in the south, the people will revolt and the Rajapakses are worried of that. Such a large army will become restless and desperate if not adequately fed and paid. So, the helpless Tamil lands created under a bogey of terrorism is a crafty idea they hatched. The Tamils are not their enemy, nor are the Tamils any capable now to go against the army. This army would be unleashed on you Sinhalese fools when it becomes necessary for the Rajapakses. You saw that in a way last year, don’t you? The target are you fools. You didn’t get the point. The president was lying. Very good leadership. But the North is not another country or is it? It is not surprise that there is a difference in the accounts. The record of “LIES” of Rajapakse regime is well known. The difference between 12,000 and 80,000 is 68,000. If we apply the same facts to the number of people massacred by Sinhala forces, then it will be definitely more than 40,000. Ajith, The president is not good in Math but he is very good in fooling Srilankans. What Weeratunga says are lies, what Mahinda says are lies, what they say about war crimes and genocide of Tamils are all damn lies. The Sri Lankan regime thrives on lies. Where is the sovereignty of the people the Sinhala elite and the political establishment talk about? It is a land like no other, land mis-governed by liars! couldn’t have said it better Thiru ! Lalith Weeratunga is self conceited guy. This many of us noticed clearly. Cant be better – birds of a feather flock together. Now what is the point of his travel to Geneva ? Can anyone explain me please ? Cant they all these carry out through a tele/video conference ? Do they the current regime have got surplus of funds to waste in this way ? No doubt they waste a lot for unnecessary foreign trips. Who to pay for that if not the common man? 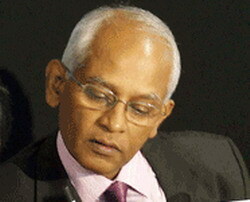 Weeratunga has taken the once proud civil service of Sri Lanka to the lowest ebb ever ! Why is he doing a politicians job ? He is basically trying to defend the Government and not the Country on the international stage. All the Country has done wrong is to continue to tolerate this tyranny but it is the perpetrators’ the GOVERNMENT who are under fire. Is it because the great GINPAPPA is afraid of certain failure ? If senior diplomats CLEARLY fail, can a secretary do more to save his president ? When uncommon things happen due to no fault of common men,exceptionally uncommon men, who are elected by common men to decide for common men, may do uncommon things such as sending uncommon representatives to Geneva when it is common practice for Permanent Representatives stationed there to attend. One thing is very clear. The Permanent Reps appointed to look after the common practices appear to be incapable of looking after uncommon things. What is boiling in Geneva is an uncommon thing. Under such circumstances nothing wrong in sending uncommon men to represent the country. Politicians the world over enjoy the freedom to talk about things that they do not know and escape without being prosecuted. Bureaucrats have to be accurate or show some degree of accuracy. If not they are hanged or kicked out. LW is a graduate in mathematics and statistics and he is also a bureaucrat. Prez MR is a lawyer and a politician and therefore know what the phrase “lies, damn lies and statistics” means. So Thiru and Ajith need not worry and get angry. MaRa is NOT a lawyer! The late Jeyaraj Fernandopulle knew that. NaRa is a synthetic lawyer and the entire population knows that?? Auto Urine Therapy to both MR and LW?? The statistical average of all the frogs is not equivalent to each and every frog! Maths is for today’s Sakuntala Devi or 5 times world champion coached by house wife mum Viswanathan Anand. Politician who speaks the truth and sandwiches with lies- like RM said and now LW says. LW=MR= RUMP!! Now pump it up moron. What is this Friday Forum? Is alcohol served at its meetings? Showing the statisics with the aid of a graph would have made it worse. Can you win a War by telling the truth ? yes, but not killing civilians okay ? Since lies are fabricated, they forget there is a need to be consistent in lies, otherwise the lies will become contradictory and will be exposed. They need a minster to coordinate the lies so they remain consistent across the regime of liars! When the government and opposition teams go to Geneva in March, they must be cross examined: The opposition fellows may turn out to be liars too! Tamils started the lie business now govt. follows them. Match a lie with a lie!! They (the Rajapakses) need you, too. Lieing or is it ignorance comes naturally to you? The island country does not look like it is triply blessed. With even statistics cooked up, it looks more like a banana republic. MR is so desperate that he is making his rounds visiting other countries with a begging bowl. This is an another proof – that these buggers change the numbers arbitrarily. They may feel that readers and IC are stupid as they are. 3) Abolishing Executive presidency, call for a free and fair election under the supervision of international monitoring committees. The following article clearly indicates that even PM of the nation makes public statements without talking to the president of the nation directly. This is the level of PRIME MINISTER under MR.
PMs statements CLEARLY point out his opinions in terms of the rule of law and order IN THIS COUNTRY seem no seriously concerned by top leadership. I thought PM is the second most respected post in the country. Hey Guys read this please !!!!!!!!!!!!!!!!!!! Prime Minister DM Jayaratne told Parliament yesterday that even a prime minister of a country should be hanged if found guilty of importing heroin. Prime Minister said he had not been rattled by political mudslinging. “I am not shaken at all and no one could shake my mind even by stabbing me. And I am ready to bow down and apologise if I have done anything wrong,” he said. A pathetic liar with a pathetic tale. What goes around comes around. It is so nice to see all these jokers going for each others throats. Is it true that Keheliya Rambukwella has siphoned of tons of money from Rupavahini and is now become a sacrificial lamb for MR. Good for the country. Why is the secretary to the President – who should be looking after the day-to-day affairs of the President – representing the country on a diplomatic mission? What happened to the Minister/Deputy Minister of External Affairs or to all the “guys and gals” appointed as diplomats? Is this country crazy or what? They are tired of telling the same lies over and over again. May be they know from previous experience that no one is prepared to listen to their lies anymore. 12,000 and 80,000. What a big difference! What a big lie by the President of the country! What for? From where did this author get hold of 10,000 – 30,000 troops to a Division? Should have read further than paragraph 1 in Wikipedia!! In modern forces even 20,000 is rare. Weerathunga is an educated man. I believe he is an ex Royalist. President from a Gamay school. You make your own judgement now. LW is an old Rahulan and a Mataran but was never a member of Rahula mafia, which was powerful during CBK regime. The entire Sinhala Armed forces,Navy and Airforce can stay in the North and East but not taking the local civilians lands and job opportunity.They should not enter in to business, or terrorising the law abiding citizens. They should be within law and order. Their he should finally LEARN that he- AS THE PRESIDENT OF THE COUNTRY has to behave in compliance with country^s consitution. This shows clearly – how serious he has been… he has zero vision and wisdom. This will clear to the nation – like a lightning in the days to come. Fall of this regime is NOT that far. It is important for the governments to have terrorist threat. It can be used to consolidate support and do war related business. If popularity drops governments can maneuver to raise terrorist groups and then deploy the army. All are aware of the fact, that GL is a lair. But between the president and lalith, who is telling the truth?